LEADERSHIP NIGHT FOR ALL COUNCILS, COMMISSIONS, AND PARISH GROUPS. MAY 14, 2019 IN THE CHURCH. 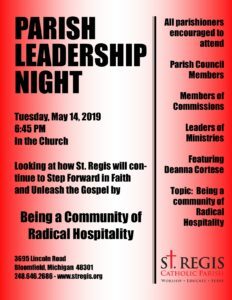 These three times a year meetings allow all the leadership of the parish to come together and focus on a common topic, help each other understand what is happening in their various ministries, and connect what they are doing to the broader mission of the parish outlined in both the Parish’s Vision Statement and the Archdiocese’s Unleash the Gospel. 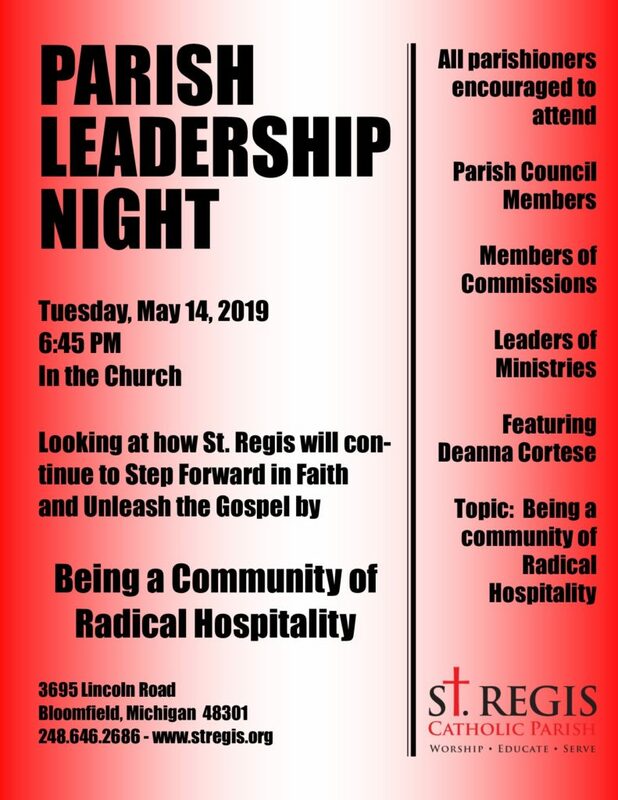 Open to all parish members. A great way to see what is happening and see if you want to connect to one or more of these groups. Begins with prayer in the Church at 6:45 p.m. followed by a presentation/discussion. The focus for May: Being a Parish of Welcome and Hospitality in All That We Do as a Parish. Presenter: Deanna Cortese. Then Commissions and Councils meet in their own groupings. Ending with feedback as a large group.